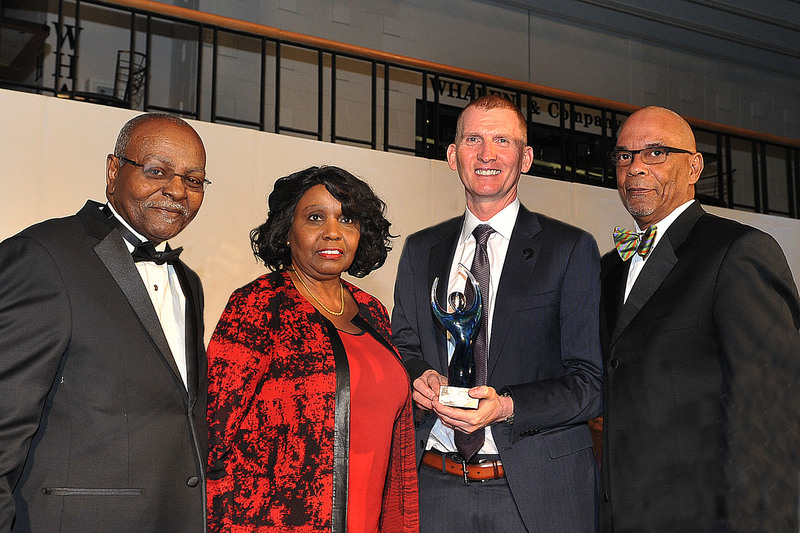 DALLAS – (Feb. 8, 2017) – VisitDallas is pleased to announce that Phillip Jones, President and CEO, was awarded the prestigious Human Relations Award by the Interdenominational Ministerial Alliance (IMA) at the organization's annual banquet on Feb. 3. The Human Relations Award is the signature award given each year to an exemplary civic, business or religious leader who has made a measurable difference serving the community with distinction and impact. "I am honored to be recognized as the 2017 recipient of the Human Relations Award. At VisitDallas, we work to attract visitors from all over the world," Jones said. "Dallas is a city that celebrates its diversity, cultures, religions, neighborhoods, cuisines and lifestyles, and we're proud to promote the welcoming nature of our city." VisitDallas President and CEO Phillip Jones (second from right) accepts the IMA 2017 Human Relations Award. Pictured left to right: IMA President Rev. Stephen C. Nash, Sr.; Dallas Area Rapid Transit Executive Vice President/Chief Operating Officer Carol Wise; Phillip Jones; and IMA Banquet Chairman Rev. David Wilson. The IMA, led by Dallas-area ministers, is a faith-based service organization which exists to improve, enhance and maintain quality of life for underserved communities by promoting uplift initiatives. Each year IMA recognizes community leaders for their exemplary service in fields ranging from education, philanthropy, clergy, civic and social services, healthcare and business. In executing the theme of the 52nd Annual IMA Human Relations Banquet – "Unity Matters: Connecting First Responders, Residents in Serving and Uplifting Community" – the interfaith group has connected those who wear the uniform with those charged with attracting visitors to Dallas. "This is a deliberate and proactive effort in showing Dallas, the nation, and the world that we are better together," said IMA President Rev. Stephen C. Nash, Sr.
VisitDallas' goal is to market Dallas as the ideal convention and visitor destination to the regional, national and international marketplace and to favorably impact the Dallas economy through meetings and tourism. The Dallas metro area is the leading business and financial center in the Southwest, offering visitors an unparalleled array of amenities and a central location with two major airports with more domestic nonstop flights than any other U.S. city. As the ninth-largest U.S. city, and part of the fourth-largest metropolitan area in the nation, the Dallas area is the top visitor destination in Texas. In 2015, Dallas partnered with CityPASS, the company that packages discounted, prepaid admission to a city's top attractions. Now, travelers to Dallas can save 41 percent off admission to the city's top attractions: the Perot Museum of Nature and Science, Reunion Tower GeO-Deck, a choice between the Dallas Zoo and The Sixth Floor Museum at Dealey Plaza, and a choice between the George W. Bush Presidential Library and Museum and the Dallas Arboretum and Botanical Garden. For more information, visit www.visitdallas.com.